Both John Solomon and Sharyl Attkisson have written similar critiques of the media in which they question the objectivity of mainstream journalists. Solomon claims that the media was too passionate and emotional in their response to Trump giving the Saudi royal family a pass on the murder of Jamal Khashoggi. On CNN, anchor Brianna Keilar suggested there was little difference in Trump’s annual rite of pardoning a Thanksgiving turkey and his treatment of Saudi Arabia. “And just the most unusual dichotomy here, as this comes on the heels of a statement that the president has put out essentially pardoning Saudi Arabia and the crown prince and the king there, despite what his intel community is expected to put out in a report today that Saudi Arabia is behind, that these leaders of Saudi Arabia are behind the killing of a Washington Post journalist,” she added. Such rhetorical flair may make the journalist emotionally satisfied for a moment. But the injection of opinion and insinuation and condemnation disserves the public for a far longer time, depriving viewers and readers of a neutral set of facts upon which to make their own decisions and opinions. With rare exception, the wise elders of the profession have not spoken up forcefully enough to denounce this creeping cancer of POV journalism, nor stem the demise of the profession’s core values of fairness, accuracy, precision and neutrality. In fact, some are gleefully cheering on some of the bad-boy behaviors. As her target, Attkisson chose the report about Trump’s desire to prosecute his political opponents. She begins by demonstrating that she is clueless about what it means for a president to direct the Justice Department about who/what to investigate. But in a classic nod to bothsiderism, regardless of the facts, Attkisson suggests that reporters didn’t take conspiracy theories into account in the kinds of questions they asked. Are all the figures who have warded off Trump from being involved in his own Justice Department really trying to keep him away so that he doesn’t uncover facts related to allegedly politically-motivated acts, surveillance and wrongdoing by some officials over the years? That is some serious pearl-clutching from a reporter who claimed that the result of a stuck delete key was the Obama administration’s attempt to hack her computer. The day that anyone takes Sharyl Attkisson’s reporting seriously is the day that we will have fully succumbed to believing conspiracy theories over objective truth. It is equally galling to be lectured about press neutrality by someone like John Solomon. I would remind you what Josh Marshall wrote about him. That assessment came as Solomon was attempting to spread lies about Hillary Clinton’s supposed “uranium deal” as a way to discredit the FBI, as well as Robert Mueller and Rod Rosenstein. From his stories at The Hill, it became increasingly clear that Solomon was basing much of his reporting on leaks from Rep. Devin Nunes and his attempts to undermine the Russia investigation. To deal with this kind of information warfare, we all have to stay grounded. There are times when it is appropriate to question mainstream media sources, but not with the kind of nonsense peddled by Solomon and Attkisson. We need to be informed about their history of spreading lies as a way to promote their agenda. That is precisely why I have consistently attempted to expose readers to the facts behind their lies. 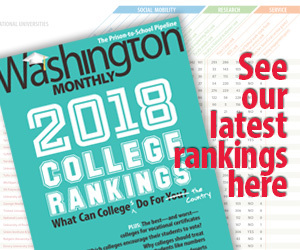 If that is the kind of objective reporting you value, I hope you’ll take a minute to make a contribution to our work here at Washington Monthly. By doing so right now, you can double your impact because every dollar you donate will be matched by a challenge grant we’ve received from NewsMatch. Please consider clicking on the banner below and making your tax-deductible contribution. Thank you!